A Houston Two Step CPR event. Image by Sarathi Kalra via Flickr. More than 4,250 Texans learned lifesaving hands-only CPR during the Texas Two Step How To Save A Life Campaign last Saturday. Heart disease is the No. 1 killer of Texans, and four out of five cardiac arrests occur at home. CPR saves lives, but most people are unprepared to help when a loved one, friend, or colleague needs CPR. More than 650 medical students representing all nine Texas medical schools taught the Texas Two Step at 53 sites within the 10 cities. “This event took an incredible volunteer effort. I am proud of the medical students across Texas who took time out of their schedules to give back to their communities. It really reflects the passion with which we are working to save lives. I think it's a great reminder of why we all chose medicine in the first place,” said Baylor College of Medicine student Jake Valentine. “I am very grateful to all the volunteers from college students to physician leaders who offered their time and energy to this project,” said UNT School of Medicine student Faroukh Mehkri. “The most amazing thing for me was to see hundreds of strangers, many of whom have never met us, come together to work tirelessly on this project. The passion that fueled this project from our end was palpable and permeated through our entire state. Thank you to everyone for learning how to Texas Two Step!" 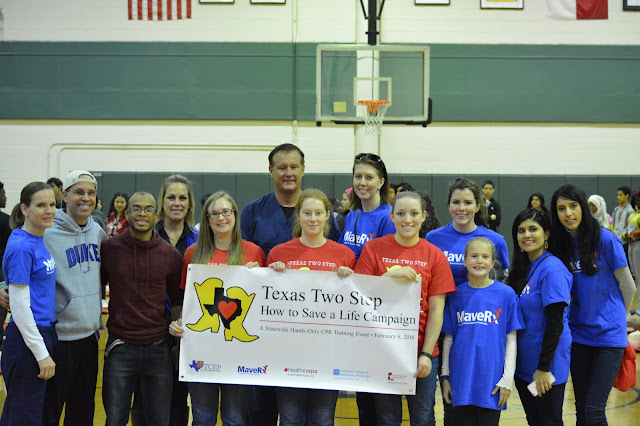 The Texas College of Emergency Physicians, Texas Medical Association, and American College of Emergency Physicians, and HealthCorps and leadership consulting firm MaveRx created the event to train more Texans in lifesaving, hands-only CPR.